I saw this movie recently with the very greatest of hopes. 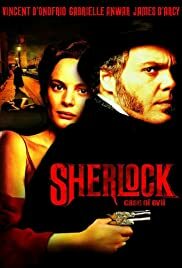 I have been a Sherlock Holmes fan for as long as I can remember, so when I saw the box for this film on the shelves at my local video store, I yanked it up without even looking at the synopsis on the back. After watching the movie, I might have enjoyed the synopsis more...a LOT more. The characters were two-dimensional and under-developed at very best: no depth at all was brought to any one of them, but for the struggling Rebecca Doyle, portrayed by Gabrielle Anwar...and in this setting, finding anything to like about her was a struggle. James D'Arcy never even saw the mark in attempting to bring humanity to the legendary Holmes; he just came off weak and vacillating in D'Arcy's hands. Vincent D'Onofrio - of whom I am an incredible fan normally, and who is notoriously known as "the Human Chameleon" for his most uncanny ability to lose himself in a role - just phoned this performance in, when I'd have loved to have seen a far more layered interpretation of this legendary bad guy. Roger Morlidge does a serviceable job of Dr. Watson, but it's just not enough. The plot was presumptuous of far too much detail relevant to the Holmes legend to introduce such intricacies as the reasoning behind the heroin addiction suffered by he and his brother, without providing much substantive sub-plot to make it plausible...or even make us care. The fencing battles between Holmes and Moriarty are well-executed, but only consume a cumulative twenty minutes of the film at the very most. Writer Piers Ashworth didn't think outside the box in his creation of this "new perspective", he just created a new box and hopped right in. Director Graham Theakston didn't seem to even attempt to transcend the poor scripting with crafty, smart, or inspiring visuals.